Visit Tovo Faraldi in the hinterland of Cervo during your stay in liguria, italy. The village is situated idyllically on a hill about 350 meters above sea level. The breathtaking view above the mountains is unique. Tovo Faraldi is not a bad starting point for water sports as well; the nearby coastlines have something to offer. The beaches of Diano Marina, Cervo and San Bartolomeo al Mare are ideal for sailing, surfing, swimming and diving. The long sandy beaches and the seemingly wilder rocky shores cater for perfect variety. If you want, there is a perfect opportunity in this place for you to transform your vacation into an active holiday full of experiences. The quiet country road, which connects Tovo Faraldi, with the neighboring villages, is ideal for non-strenuous jogging or hiking. Walks can also start from here to the neighboring villages. The old oil mill "Sangue" in Tovo Faraldi is particularly worth seeing. This was formerly pulled by draft animals and has now found its place in Tovo Faraldi. Furthermore, you are not too far away, if you want to experience something more. You can make a short detour to the villages and towns around, and there you will have the choice between dripstone caves, numerous markets, beautiful overgrown gardens and much more. 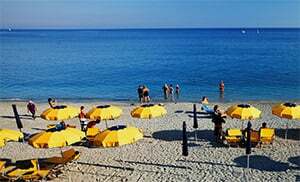 You will also find everything you need as a tourist in the neighboring coastal villages: restaurants, bars, nightclubs, pharmacies and shops of all kinds. Tovo Faraldi belongs to the beautiful seaside village of Cervo, together with Villa Faraldi, Deglio Faraldi and Riva Faraldi. Tovo Faraldi became part of the Imperia Province in the Middle Ages and was incorporated into the Cervo Municipality. Tovo Faraldi belongs to the Cervo municipality and is a village in the Imperia Province located In the Liguria region. There are several other villages near Tovo Faraldi like: Tovetto (1km) Villa Faraldi (1.9 km) and Chiappa (4.4 km). Take the highway exit San Bartolomeo al Mare from Genoa and follow the SP34 to Via Piave in Villa Faraldi.